Definition at line 28 of file sha1.c. Definition at line 29 of file sha1.c. Definition at line 26 of file sha1.c. Definition at line 30 of file sha1.c. Definition at line 31 of file sha1.c. Definition at line 32 of file sha1.c. Definition at line 33 of file sha1.c. Definition at line 35 of file sha1.c. Definition at line 36 of file sha1.c. Definition at line 37 of file sha1.c. Definition at line 38 of file sha1.c. Definition at line 39 of file sha1.c. Definition at line 24 of file sha1.c. Definition at line 171 of file sha1.c. Referenced by finalize_hash_impl(), sha_check(), and VerifyInteg(). Definition at line 102 of file sha1.c. Referenced by A_SHAFinal(), init_hash_impl(), sha_check(), and VerifyInteg(). Definition at line 128 of file sha1.c. 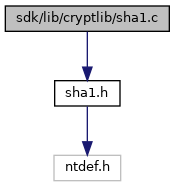 Referenced by A_SHAFinal(), sha_check(), update_hash_impl(), and VerifyInteg(). Definition at line 42 of file sha1.c.